Happy Friday the 13th! For some reason, I’ve always loved this date – and today, I get to celebrate one of my favorite days with a little extra excitement. 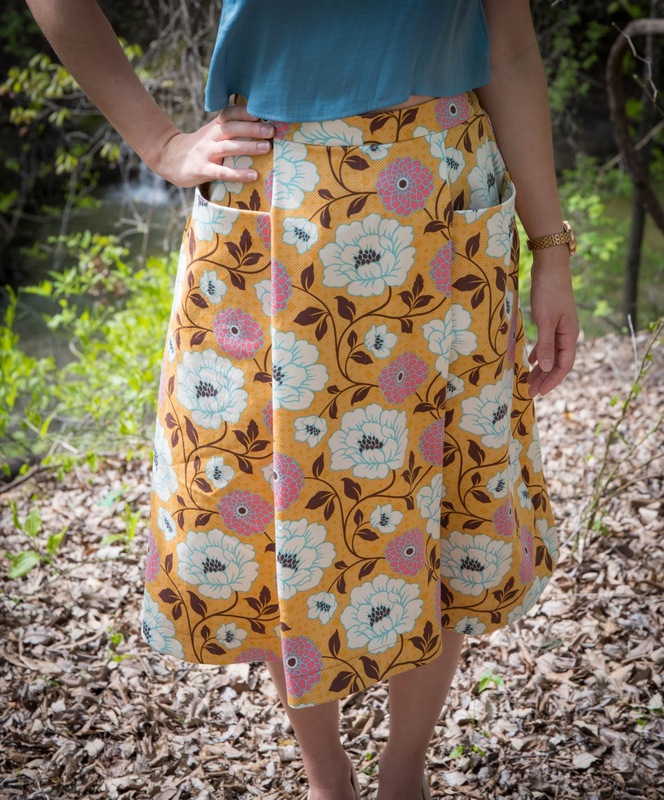 Earlier this year, Amy Nicole asked me if I’d like to participate in the upcoming blog tour for her first ever pattern, the Patti Pocket Skirt. I’d been eyeing the pattern for awhile, so of course I was so excited to be asked! The best part, though, has been working a bit with Amy – if you have not had the pleasure of talking with her, even if just in short back and forth emails, you are missing out. She is such an absolute pleasure! She is cute and spunky, and her kind attitude is contagious. She made it even more lovely to work with her awesome pattern! Amy recommends stable, medium to heavy weight fabrics for this skirt. Anything from quilting cotton to denim could fit the bill, so I had a hard time choosing just the right fabric out of my stash! 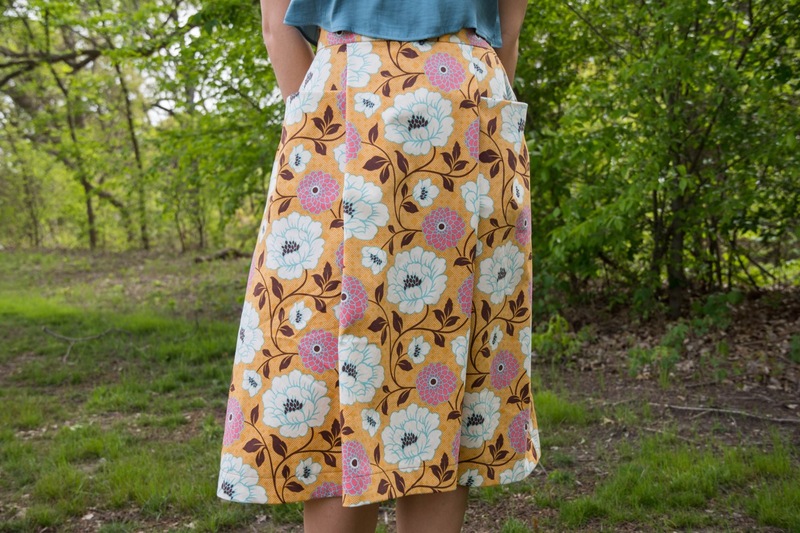 I narrowed it down to three options – a robin’s egg blue floral quilting cotton, a bright yellow floral scuba crepe, and this lovely mustard colored floral cotton sateen. (Spring obviously makes me think florals!!) The skirt has such a cool structure to it that I ultimately decided to play up the details with the sturdiest of my fabric options. This fabric is actually sold as a home dec fabric; however, as you may have seen with some of my previous makes, you can’t deter me from a pretty fabric just by telling me it is supposed to be on a chair! home dec fabric offers such great structure! I utilized the printing services of the wonderful www.pdfplotting.com for this pattern, as the print at home version has 62 pages and I get a bit intimidated with anything over 50! I will note, though, that Amy does include which pages are needed for each separate version within her instructions, so if you don’t need all 62 pages, you don’t have to print them all. This is a genius idea! 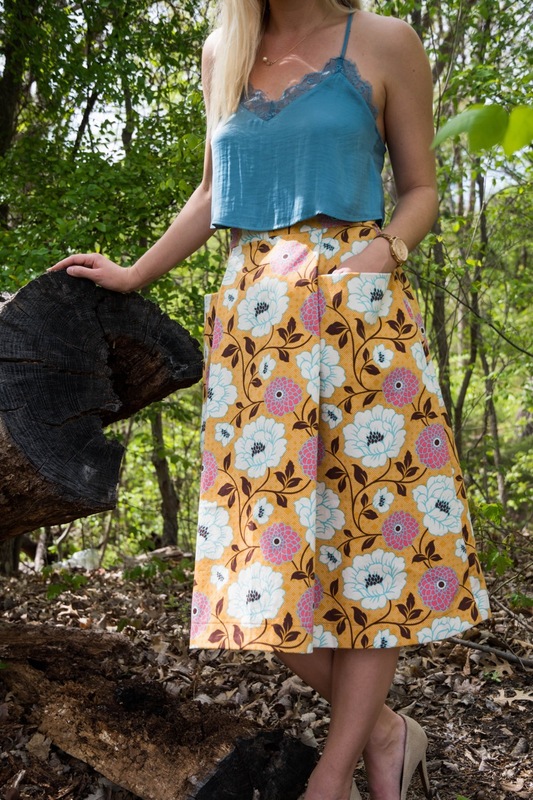 I chose to make View B, the midi-length version of this skirt. Throughout her website and her instructions, Amy does note that her patterns are specifically made for petite ladies! She makes suggestions of where one may want to add length if they are about 5’4” – despite being a little bit tall at 5’8”, I decided to leave the pattern as is. Unless there are glaringly obvious changes I need to make, I like to make patterns as they are the first time around just to see how it goes! In the future, I don’t plan to make any changes to this midi-length version. I think it hits at a lovely spot, and I’m so happy with it. I do intend to try out the mini version at some point, though! Aside from the great garment you end up with at the end, the best thing about this pattern is Amy’s construction methods. 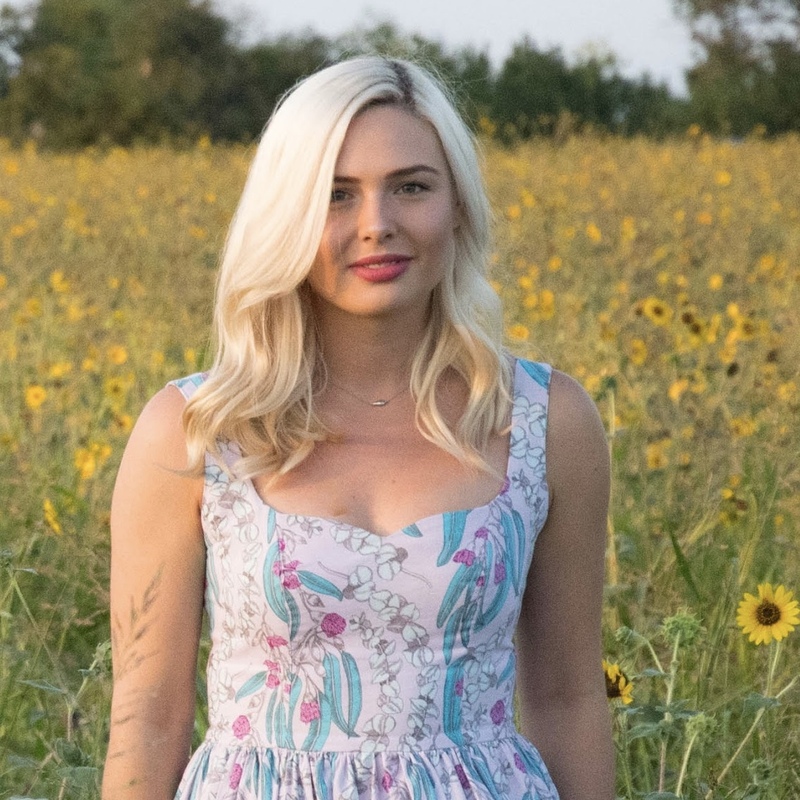 As a very experienced sewist with factory garment experience, she introduces makers to a super efficient, assembly line style of garment making. This was a bit of a departure from my standard sew a seam, press a seam, back to the sewing machine style of making things, and let me tell you… I LOVED IT! I’m incredibly impressed with the directions, especially considering this was her first published pattern. I’m hoping that with a little practice I’ll be able to apply her super efficient method to all of my sewing endeavors – I truly felt that it made such a difference. I’m not a super quick sewist, but I was able to rearrange my sewing room, cut the fabric, and almost complete the skirt (aside from finishing the waistband and attaching the hem facing) all in one short afternoon! look at those huge pockets! If you’re looking for a great new garment to sew up, I would absolutely recommend this pattern. I enjoyed putting it together, and love the funky yet classic piece I’ve ended up with. I’m really looking forward to more Amy Nicole patterns releasing in the future! Skirt: Pins & Pinot – Handmade by Me! the back pleat detail on this skirt is just as beautiful as the front pockets! If you’d like to check out some other gorgeous Patti Pocket Skirts, I’ve linked the rest of the blog tour participants below. Check their awesome versions out over the next week or so, then head on to the link above to get your very own copy! Though the pattern used in this post was provided to me by Amy Nicole Studio, all opinions expressed are my own, as always! heading out to take blog photos! Previous Post Another Vogue 9253 – This time in GREEN!